Canadian Prime Minister Justin Trudeau is under pressure following a report alleging attempts at political interference in a corruption case against engineering giant SNC-Lavalin. The Globe and Mail newspaper reported, citing unnamed sources, that someone in the prime minister's office pressured former justice minister and attorney general Jody Wilson-Raybould to push for a legal favour for the Canadian firm. Canada's independent ethics commissioner, who advises politicians on how avoid to conflicts between public duties and private interests and investigates possible contraventions, has launched aninvestigation into those allegations. Then the PM's top aide left, denying in a statement that he or anyone on his staff did anything wrong but saying he had to leave so as not to be a distraction from the "vital work" being done by the team. In summary: it has escalated quickly into a major political firestorm for the prime minister and the Liberal government. When he swept into power in 2015, Mr Trudeau promised "real change" for Canadians with a commitment his party would be open and transparent and increase trust in democracy and democratic institutions. Now, a former top minister claims that the prime minister and members of his inner circle improperly pressured her to intervene in a case involving a prominent firm that employs thousands and has deep roots in Quebec - a province expected to be a tough battleground in this year's federal election. Jody Wilson-Raybould said she and her staff were repeatedly asked over four months to push the Public Prosecution Service of Canada - an independent authority whose main objective is to prosecute federal offences - for leniency for the firm. She said one conversation with her chief of staff included a senior aide suggesting that "there is no solution here that does not involve some interference". The agreement - similar to regimes in the US and the UK - essentially suspends prosecution while allowing a firm to sign on to an agreement that could see it face alternative terms or conditions, like penalties or enhanced compliance measures. The fact the Liberal government brought in the remediation agreement regime in 2018 as part of a massive budget bill - following lobbying efforts by the company - has not helped with optics. The prime minister has insisted for weeks that all communications between himself, government officials and Ms Wilson-Raybould were above board. Whatever comes out of this political crisis, it will be hard for the Liberals to claim they have brought anything like "real change" to Ottawa. One of Mr Trudeau's main pledges for his mandate was a "full reconciliation" with Canada's indigenous peoples. 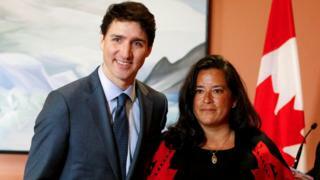 When Ms Wilson-Raybould was first sworn into Cabinet in 2015, she was heralded as the first indigenous justice minister, a symbolic milestone and a sign of Mr Trudeau's commitment to that reconciliation. A lawyer by training, she is the daughter of hereditary chief Bill Wilson, a politician who helped push former prime minister Pierre Elliot Trudeau, Mr Trudeau's father, to enshrine indigenous rights in Canada's constitution. Then last month, she was shuffled out of the justice portfolio and into veteran's affairs, a move widely seen as a demotion. She said she believes the reason she was shuffled from justice was because she refused to budge on the SNC-Lavalin affair, something Mr Trudeau denies. Her decision to quit cabinet suggests that, by the end, little love was lost between her and the prime minister. In her resignation letter, she proffered her admiration and respect for veterans and thanked "all Canadians", her officials, and her staff - but offered no words of praise for the Liberal leader. Since Ms Wilson-Raybould resignation, Mr Trudeau's pledge on reconciliation - already being questioned by First Nations leaders - was further challenged. Assembly of First Nations National Chief Perry Bellegarde said in a statement that he "is concerned about the many unanswered questions about Jody Wilson-Raybould's departure and this is echoed by many First Nations across the country". Ms Wilson-Raybould's father pulled no punches, posting online that his daughter "was demoted because she would not 'play ball' with the Big Boys who run the Liberal Party". Mr Trudeau is a self-described feminist and has used his time as prime minister to promote gender equality. At a news conference following his minister's resignation, Mr Trudeau said he was "puzzled" by her departure, adding it was her responsibility to come to him if she had concerns about the SNC-Lavalin matter, and that she never did. This came on the heels of anonymous government sources and pundits suggesting to the media that Ms Wilson-Raybould was someone who was "difficult". Another Liberal MP tweeted: "When women speak up and out, they are always going to be labelled. Go ahead. Label away". The Union of BC Indian Chiefs called on the prime minister to "immediately and categorically publicly condemn the racist and sexist innuendo" about Ms Wilson-Raybould. A number of indigenous scholars came forward to decry her "character assassination". "This feels very familiar to many women across the country, now rolling their eyes, recognising this for the stereotypical cheap shots against women who beg to differ," they wrote. Conservative party deputy leader Lisa Raitt told journalists in Ottawa on Wednesday that Ms Wilson-Raybould's "reputation has been dragged through the mud, the Liberal mud." New Democrat MP Niki Ashton said on Twitter she was "disgusted" by Mr Trudeau's "condescension". Mr Trudeau later issued an apology calling "the comments and commentary and cartoons" made about her "unacceptable".